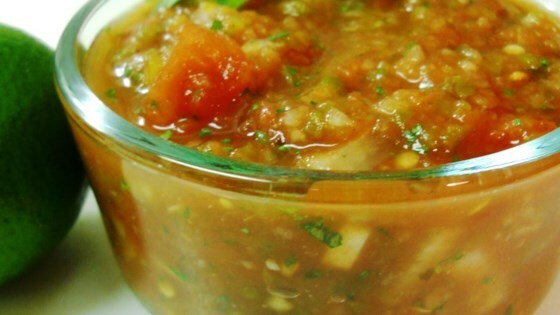 "This all purpose salsa is great on tortilla chips, tacos and other Mexican-style favorites. Roasted jalapeno chile peppers give the salsa an excellent flavor." Place jalapeno chile peppers on a medium baking sheet. Bake in the preheated oven 15 minutes, or until roasted. Remove from heat and chop off stems. Place jalapeno chile peppers, garlic, onion, white sugar, salt, ground cumin and diced tomatoes with green chile peppers in a blender or food processor. Chop using the pulse setting for a few seconds. Mix in whole peeled tomatoes. Chop using the pulse setting to attain desired consistency. Transfer to a medium bowl. Cover and chill in the refrigerator until serving. This was wonderful! My boyfriend says "Mmmm mmmm good!" We used Mexican style Rotel tomatoes with cilantro and lime, and one more jalapeno. We are just raving at how good it was!